Ireland's Fionnuala McCormack will be joined by the two most recent women's winners at the Antrim International Cross Country event on 16 January. Ethiopia's 2015 winner Birtukan Fente Alemu and 2014 victor Mimi Belete of Bahrain will both run at Greenmount. Belete demonstrated her continuing good form in 2015 by reaching the World 5,000m final in Beijing. 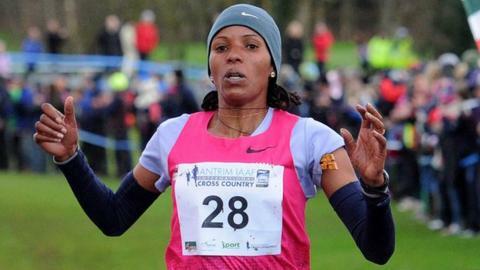 European cross country gold medallists Louise Carton and Yeman Crippa will also compete in the Antrim event. Belgian Carton won the women's under-23 title in Hyeres last month with Italian Crippa retaining his junior title in impressive fashion. Crippa, who also won a European junior 5,000m bronze medal last summer, will be part of a men's field with includes last year's winner Uganda's Thomas Ayeko and Bahrain's Aweke Ayelew. Newcastle athlete Kerry O'Flaherty will lead the local women's challenge after being part of Ireland's European team bronze medal success in Hyeres. Emma Mitchell, who represented Ireland in the under-23 event last month, will also compete while the local men's entry will include Paddy Hamilton, Seamus Lynch and Declan Reed. Irish star McCormack, who finished fourth in the individual event in Hyeres, won the Antrim event in 2012 and 2013.